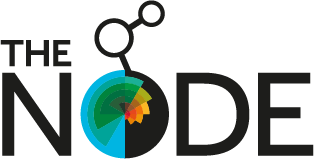 BSDB Autumn Meetings can be organised by members. So do not hesitate to approach meetings@bsdb.org if you have any ideas. However, note that we are booked for meetings through to 2021 (see BSDB meetings webpage). So think ahead, let us know, and we will help you with the organisation. 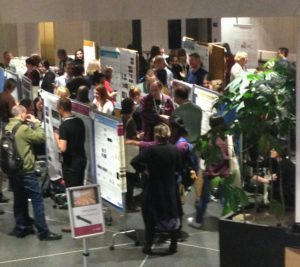 Read here a report about the Autumn Meeting 2017, jointly organised by the BSDB together with the Swedish, Finish, Norwegian and Danish Societies of Developmental Biology, which took place 25-27 October 2017 in the Aula Medica of the Karolinska Institute in Stockholm, Sweden. Attendance – With volunteers and sponsor attendees we had a total of 212 attendants, of which 194 were registered scientific attendees, 15 were invited speakers, and 22 were BSDB members (8 being supported by travel grants). Other than UK attendees, Sweden (understandably) had the most attendees (94) but there was also a strong showing from Denmark, Finland and China. We additionally had attendees from Austria, Ireland, Brazil, Norway, Spain, Czech Republic and USA. Program – We aimed to have a general scientific program covering all aspects of Developmental Biology in plants, invertebrates and vertebrates. With Tom Jessell (Columbia University, NY. USA) as our EMBO-sponsored plenary, there was a strong emphasis on nervous system development (Session 1 -13 talks), which included development of motor circuits, visual circuits, enteric nervous system, regeneration, neural crest, evolution and single cell transcriptomics. Highlights of this session were Tom’s superb talk who explained how they pick apart the identity and function of interneurons, and the presentation by Igor Adameyko (Karolinska Institute, Sweden) about single cell transcriptomics in neural crest development. Session 2 (15 talks) was on organogenesis & morphogenesis and covered mathematical modelling of development, mammalian blastocyst, pancreas, heart and kidney development, and vertebrate genetics. A particular highlight was Leif Andersson’s (Uppsala University, Sweden) talk who illustrated wonderfully how structural genomic changes contribute to dramatic phenotypic evolution in birds, with particular emphasis on behaviour and plumages. Session 3 (8 talks) was on stem cells & regeneration which included a huge variety of science, including the role of forces in developing stem cell niches, regeneration in salamanders, skeletal muscle, tissue repair and regeneration and organisation in plants. A highlight was Ari Pekka Mahonen’s presentation who presented his work identifying a core regulatory network within the cambial stem cell niche in Arabidopsis. We also had two 3hr-long poster sessions with drinks and nibbles. The buzz was really fantastic, attendance was superb and, in fact, we had to ask people to leave at the end of both evenings, so security could close the building. 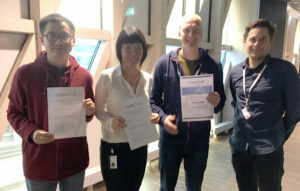 Prizes – The Swedish society for developmental biology (SWEDBO) gave out three €100 travel grants as poster prizes to Yiqiao Wang (Karolinska Institute, Sweden), Mariane Teradup Pedersen (Univ. Copenhagen, Denmark) and Li Hi (Stockholm University, Sweden). A prize of €200 donated by Scanbur, was awarded to Arvydas Dapnkunas (University of Helsinki, Finland) for his work developing a 3D culture system to explore factors governing the organisation and self-renewal of nephron progenitors. 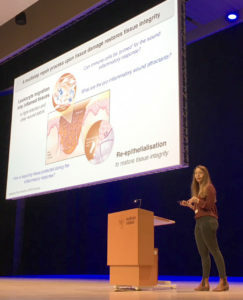 Finally, the BSDB organised the Dennis Summerbell Award Lecture which was given by Helen Weavers on the inflammatory response to tissue damage in Drosophila (see details here). Venue – What can I say … the Aula Medica at the Karolinska Institute was amazing! Beautiful, beautiful building! Amazing staff! Best AV I’ve experienced ever! Great areas for posters and sponsors! Super comfy chairs! A green room! With showers (just in case…??)! And the best of it all: we could get it at a good price since it was organised internally through the Karolinska Institute. Sponsorship – Joe Rainger led on the recruitment of sponsors, including designing the different sponsorship rates, contacting sponsors and assisting them on-site, and establishing communication between sponsors, Aula Medica team and conference attendees. The effort the sponsors themselves put in was great. For example, Nikon and Zeiss bought microscopes including a spinning disk confocal from Nikon. Everyone came away really happy, and Aula Medica was very impressed, as were the sponsors.